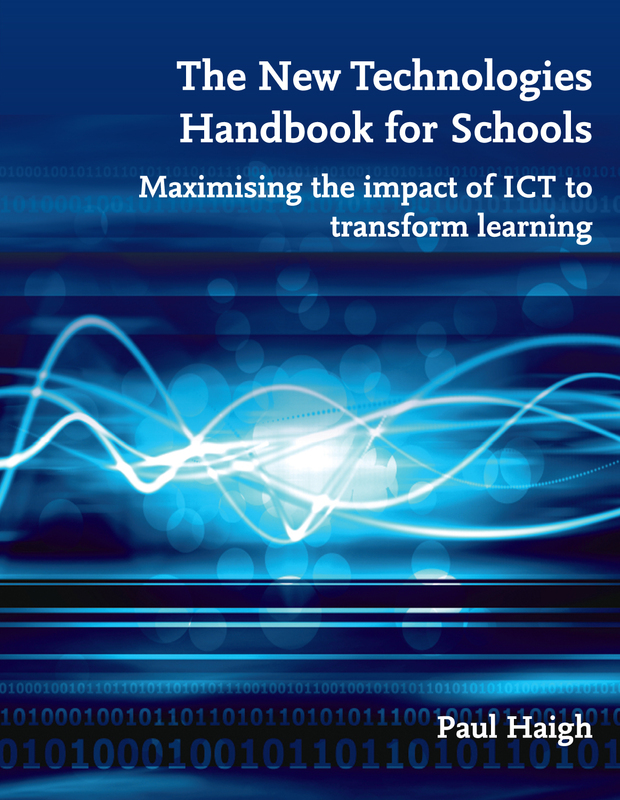 The New Technologies Handbook for Schools will help you to strategically exploit the evolving potential of ICT throughout your school. Covering the fundamental issues and opportunities, this resource will help your whole school to embrace new technology and maximise its positive impact on learning and teaching. address issues that all teachers should understand about e-safety and inform them about protecting themselves from the risks involved. With reductions in government-funded support and guidance, The New Technologies Handbook for Schools will help fill the gap and support you and your school in getting to grips with the emergence and evolution of new technology in education. Paul Haigh’s new e-book ... covers just about the entirety of school ICT, from vision to practical reality, and always with a careful eye on the key business of learning. That passion is there, sure enough. But it’s certainly not the kind of visionary book that leaves you thinking, “OK, but what do I actually have to do?” Because, you see, he actually does tell you what to do. One way to get Paul Haigh’s message is to read the book end to end, like a novel. It certainly works like that – there’s a coherent narrative moving from vision to implementation and on to maturity. A school leader who is stirred to find out what this ICT business is all about may well use the book in that way. That’s possible, but my feeling is that most readers, of whatever level of expertise, will look at the headings and be drawn initially to whatever are their current hot topics. They’re all there after all, including the ones you’ve undoubtedly chewed over -- interactive whiteboards, parental engagement, social networking. They’re dealt with wisely and with a careful eye to the fact that not all schools, or teachers, or families, are the same. For me, the first port of call was to see what the book says about bringing student-owned devices on to the school network. It seems pretty obvious to me that accepting student devices is surely a foolproof way for any school to transform its ratio of devices to students, I was keen to read Haigh’s chapter on the subject. His stance is clear and resonates through the whole book. Extend this to what the world calls “mobile phones” though, and as the author has found, you can stir up a hornets’ nest. The section in his book called “Dealing with the media – a personal experience” should be required reading for all teachers and heads. In October 2009 Haigh’s views on the value of using students’ own mobile devices in school were widely reported, and the media sniffed the air, picked up the scent of “teacher actually encourages dreaded mobile phones in school” and went to town along lines that aren’t difficult to imagine. There are issues, of course, technical and pedagogic around the business of integrating a varied range of devices in school, including those owned by students. Unsurprisingly perhaps, Haigh concludes that most of the problems go away when you use the Cloud for your school systems and provide web-based access for anyone who needs it: staff, students, parents. Right from the beginning of the book, in fact, Haigh plunges into an explanation of the Cloud, and provides practical examples of collaboration with Google docs, and of children working in the cloud with Etherpads. Practicality, in fact, is the name of the game here. Yes, the book is visionary – Paul Haigh is way ahead of most when it comes to seeing what ICT can do for learning – but it’s a vision that’s well leavened with reality. Which is to say that he knows how to make things work in real schools. He’s very aware, for example, of the importance of having the right leadership structure for ICT – the most effective mix of senior, middle and technical leadership and management. Look at any of the schools that are applauded for their work in ICT and you’ll find that they’ve got that team right. So, under the general heading of “Turning the vision into reality”, Haigh has a section on people that’s not just about leadership in general, but on the appropriate, named management and leadership posts, such as “technical manager” and “assistant headteacher (innovation)”. Practicality in support of vision is equally evident in the way Haigh has a constant eye on the need for good professional development. In fact it’s quite possible to see the whole book as an effective CPD handbook on “How to develop and run your school’s ICT policy”. It comes, for example, complete with the necessary support material. So there’s a self-assessment “Where are we now?” activity and PowerPoint presentations including one on “Navigating the way to future learning” that covers everything from “Why ICT?” through VLE and MIS to parental engagement. That one’s so comprehensive, in fact, that it would ideally be used part by part over a period of days or weeks, depending on the leader’s judgment of pace. All in all, Paul Haigh has made here a significant contribution in the drive to help school leaders see the potential of ICT as a transformer of learning. Now, though, it needs to be picked up and put into action, over a well-judged time scale, in schools or across groups of schools, by those who can see its potential and have the will to bring it to classroom and staffroom life.